The most impressive thing about the Angelico is the presence of the long detent escapement paired with a tourbillon. The escapement was invented in the 18th century to provide super precision in marine chronometers. The only downside was that it was susceptible to lateral shocks. For this reason alone, the escapement rarely appears in a wristwatch despite its superior chronometry. But Claret resolved the issue by incorporating an anti-pivot cam in the balance spring that works in conjunction with a safety finger. The Angelico’s manual-winding movement is also known for its constant force delivered via the Dyneema nanofiber cable fusee transmission mechanism connected to the double mainspring barrel. Note the word “cable”, and not the more common chain with multiple links. Swapping it out for the ultra-thin cable optimises efficiency as there is no friction, and improves the regulation of the power reserve (maximum 72 hours). These components are placed on the dial side, allowing you to witness their technical marvel. The watch displays two time zones via two jumping hour apertures. It comes in 5N red gold or titanium, each a limited edition of 10 pieces. The red gold features a triangular minute marker in red gold embellished with a red ruby while the titanium has a white gold marker set with blue sapphire. Based on the Chronomètre FB 1, which nabbed the Aiguille d’Or, the top prize at the GPHG 2016, the Chopard-owned Fleurier manufacture has chosen to focus on the finishing for the Chronomètre FB 1.1-2. The unusual case shape with its six distinct edges now comes with a yellow gold dial that has been hand-engraved using a “rocker” tool to create a shimmering surface. This natural patina recalls the dial of the astronomical pocket watch No.3 that also inspired the Chronomètre FB 1. The sides of the edges are set with baguette diamonds. Meanwhile, the bridges of the movement are decorated with a pyramid motif, which is inspired by the base of an ancient clock by Berthoud. Limited to 5 pieces, the COSC-certified movement boasts a fusee-and-chain transmission that provides constant force to the balance spring. Who Says There Is Only Jewellery At JeweLuxe Singapore? 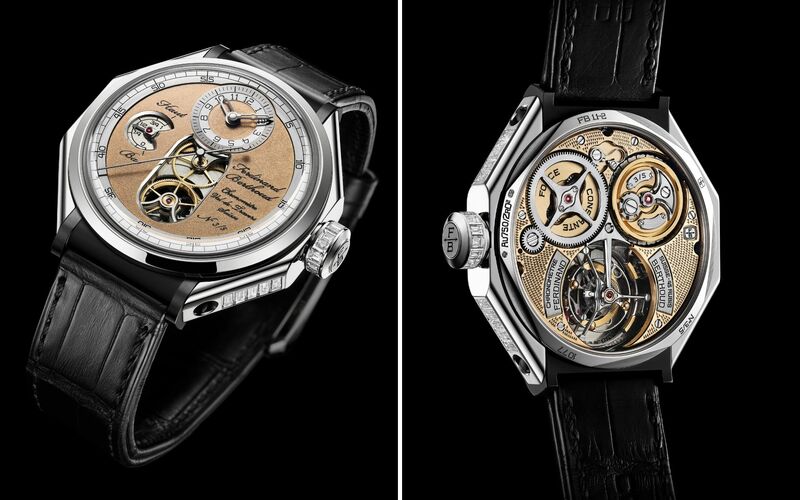 Speake-Marin Minute Repeater Flying Tourbillon “Légèreté” before (left) and during activation of the minute repeater when the XII numeral temporarily "disintegrates"
The absolutely transparent sapphire crystal case reveals the Calibre SMAHH-02 in all its glory, including a 60-sec flying tourbillon in the shape of the Speake-Marin logo at ‘6’. What’s more fascinating is that the Roman numeral XII “disintegrates” when the minute repeater is activated via a slider on the left hand side of the case, and returns to normal after the time has been chimed. The minute repeater consists of one hammer for the hour, three for the quarter and one for the minute; all hammers are welded to a block to create a sound box with the case for a nice Carillon chime. With the inner mechanism completely exposed, much care has been taken to give the parts a luxurious appearance that includes circular grained bridges and main plates as well as polished screw heads and countersinks. This remarkable watch features two balances that beat in harmony to produce unparalleled precision. Based on the resonance phenomenon where two animate objects vibrate at the same frequency, such harmony can only be achieved in a watch movement if the difference in frequency between the balances does not exceed five seconds per day of cumulated difference in six positions. The Chronomètre à Résonance celebrates its 20th anniversary this year with a platinum case with 18k white gold dial and a 18k rose gold case with matching rose gold dial. The pair of balances allows the watch to indicate two time zones, one on a 12-hour sub-dial at ‘3’ and the other on a 24-hour counter at ‘9’. The sub-dials are decorated in silver Clous de Paris guilloche. The name is inspired by the shape of the case where the middle portion is curved like a bridge. It is complemented with similarly curved lugs that deliver the perfect fit for the wrist. The Grand Feu enamel white dial is a study in minimalist chic, adorned only by extra slim hour markers and Roman numerals at ‘6’ and ‘12’, as well as “assegai-shaped” hour and minute hands; there’s no seconds hand. A honey-coloured leather strap completes the classic look.